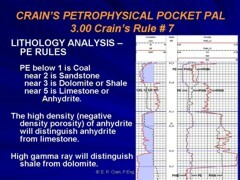 In a joint venture with PetroLessons LLC, all of Crain's Integrated Petrophysics Lectures have been converted to video format. The technical content is identical to the PowerPoint narrated slide shows available from this site, but the slide format has been optimized for wide screen presentation and for mobile devices. Course notes and exercises are included. When you register, you receive unlimited access to the video course on-line for one year, plus Lecture Notes and Exercises. Start the course anytime and proceed at your own pace. Repeat any segment as often as you need, anytime, anywhere you have Internet access. Corporate licenses available. If you are into on-line learning, this is the place for you! 39 Courses and 3 Bundles to chose from - mix and match to suit your needs. Please note that all questions and support requests should be addressed to PetroLessons LLC, as we have no direct access to their system.